Each VOD area is set up to use a single payment processor. All users that sign into the VOD area use this payment processor (unless overridden for that user, see here). 1) In the VOD Menu, go to Areas. 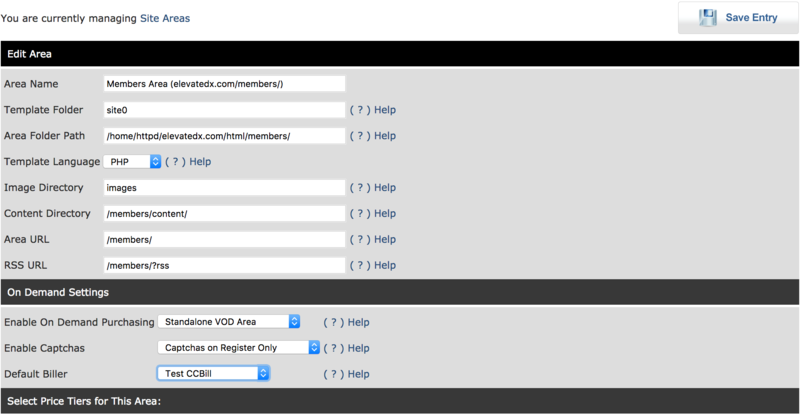 2) Find the relevant VOD area you wish to change. If you see multiple areas, you will want to make sure this is an "On Demand Area". Click "Edit"
3) Under "On Demand Settings", change the value of "Default Biller". In new VOD installs, this value is generally set to "Auto-Decline Biller". This is done so that new signups to your site cannot make any purchases until your payment processor setup is done. Change this to the payment processor you wish to use for this area. 4) Once you have done this, click "Save Entry"
Your users will now use this payment processor instead of the previous one you had in place.